Innovation. It’s everywhere at the Remai Modern Art Museum in Saskatoon. You can hear it in the enthusiastic voices of people who work there. You can see it through the iconic building that’s transformed the banks of the South Saskatchewan River. And you can experience it firsthand by touring its exhibits and participating in its programming. 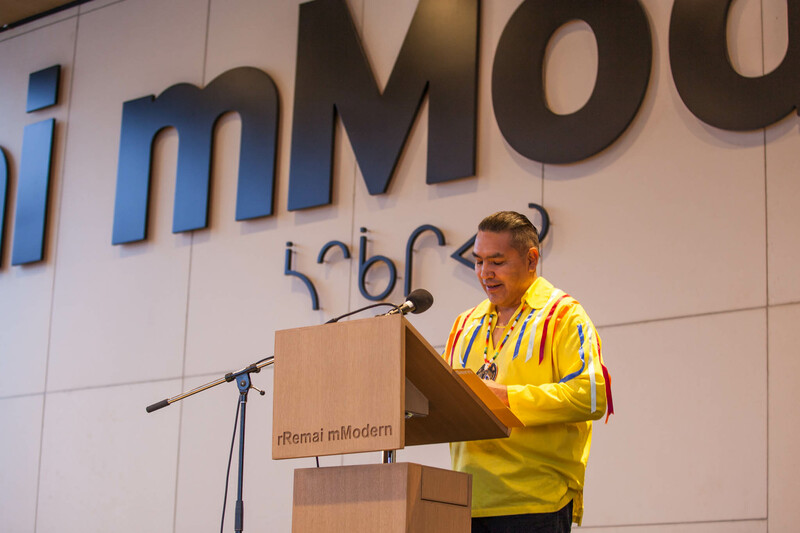 One of the most innovative aspects of the Remai is its committed approach to Reconciliation. In fact, its policies and programs have been developed in response to the 94 Calls to Action identified in the report of Canada’s Truth and Reconciliation Commission. Lyndon J. Linklater is proud of that, and excited to report that the directors of the Remai reached out to consult with him far in advance of the museum’s grand opening of the art museum. He serves as the Indigenous Relations Advisor for the Remai, guiding the relationships between the Remai and representatives of First Nations and Métis communities. The Remai sought Lyndon’s professional advice to address challenges of inclusivity they felt could lie ahead. Linklater’s advice? “Talk to people. Talk to Elders from First Nations and Métis communities. Talk -- and then listen and act accordingly.” That advice for respectful dialogue and action became a big part of the job he does today. “My job is getting people together. Building bridges of understanding and respect between communities, First Nations and Métis communities, members of the public, and my own colleagues through professional development. Linklater goes on, “There’s a ‘rethink’ going on in our country; organizations are increasingly recognizing the importance of undertaking the recommended actions. While the Remai is an innovator in this, we are not alone: other organizations are also moving toward Reconciliation. One of Remai Modern’s major exhibitions upcoming in 2019 is Rebecca Belmore’s Facing the Monumental, which chronicles the Anishinaabe artist’s 30-year career. In addition to the exhibit, related programming will provide opportunities for audiences to learn and talk about the works, which depict often-political themes of water and land rights, women’s lives and dignity, violence against Indigenous people by the state and police, and the role of the artist in contemporary life. Programming at the Remai Modern is supported by funding from Saskatchewan Lotteries Trust Fund for Sport, Culture and Recreation.